Stone bramble is a cold region fruit. It is widespread across Northern Europe to Northern Asia and China. It has also been found in Greenland. This plant grows wild in brad leaved forests, young forest heaths, ridges, rocky and stony ridged forests, meadows, banks etc. 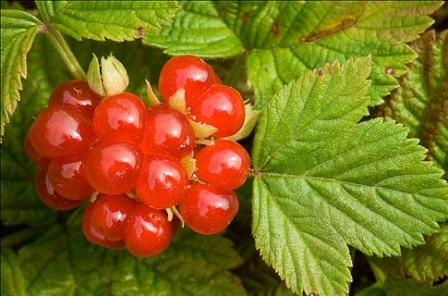 Stone bramble plant has a habit of producing long runners which can at times be upto 3.5 metres long. Herbs or subshrubs, to 40 cm, armed or unarmed; stems usually creeping, ˂± woody basally˃, sparsely to densely hairy, eglandular, not pruinose; prickles absent or sparse, erect, weak, 1–3 mm, narrow-based. Leaves deciduous, ternate; stipules ˂free from petioles˃, lanceolate to ovate or elliptic, 6–11 mm; ˂petiole 2–11 cm; petiolule of terminal leaflet 8–20 mm; lateral leaflet sessile or subsessile˃; terminal leaflets ovate to elliptic, 4–8 × 3–7 cm, base tapered, unlobed, ˂lateral leaflets sometimes shallowly lobed˃, margins coarsely doubly serrate, apex acute, abaxial surfaces unarmed, sparsely hairy, eglandular. Inflorescences axillary, 1–6-flowered, cymiform or umbelliform. 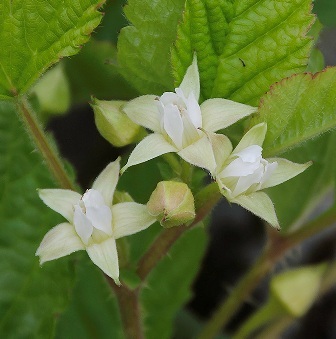 Pedicelsunarmed or prickles weak, erect, hairy, eglandular or sparsely stipitate-glandular; flowers bisexual; petals greenish white, narrowly obovate, 5.5–7 mm; filaments laminar; ovaries glabrous. Fruits red, globose, 0.5–1.5 cm; drupelets 1–10, not or weakly coherent, separating with torus attached. The fruits, though having slightly acidic flavour, are edible and eaten. These can also be processed to make jam or jelly. Russians eat stone bramble fruits plain with sugar, honey, or milk. They also use these in in preparation of kissel, kompot and kvass. Stone bramble fruits are still collected from the wild and this fruit has not yet been brought under cultivation. New plants can be raised from seed which requires cold stratification for 8-10 weeks. The best way to propagate this fruit is by runners which are formed by it naturally. 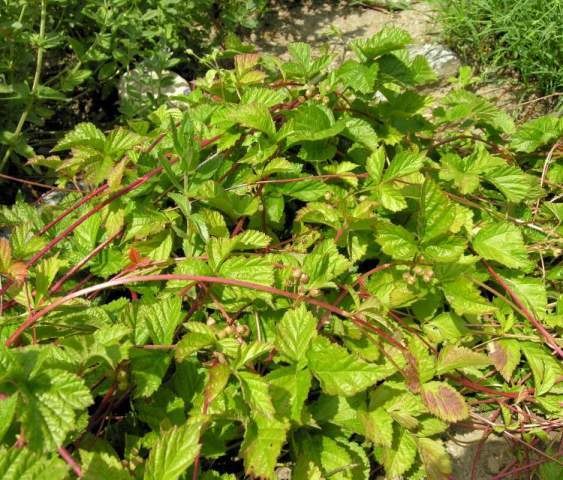 A decoction of the stone bramble root is useful in the treatment of relaxed bowels and dysentery, and also in treating the spasmodic stage of whooping cough. The leaves are astringent and a decoction is used to treat dysentery and some types of bleeding.